Where can you turn for key facts about the semiconductor industry and market, including the size of the global semiconductor market ($412 billion), U.S. semiconductor industry market share (46 percent) and the top end-use market for semiconductors (communication devices)? These data points and many more are now available in the recently released 2018 SIA Factbook! The 2018 Factbook presents an easy-to-understand picture of the trends in the U.S. semiconductor industry and global market using data. Factbook sections include data on the global industry and market, capital and R&D investment, jobs, and productivity. Data is updated through 2017, and most of the data is presented over a 20-year period, which gives the reader a helpful picture of long-term industry and market trends. The U.S. semiconductor industry has a great story to tell about how semiconductors improve our lives, strengthen our country, and build our future. The SIA Factbook provides one unique and critical way to tell this story: through numbers. 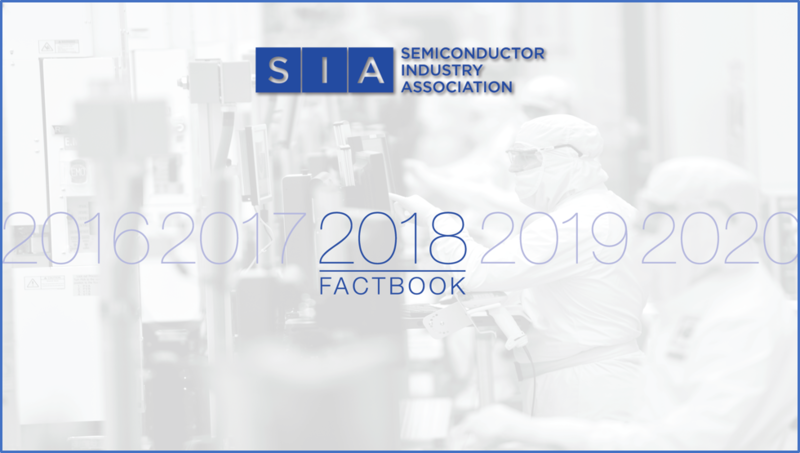 The SIA Factbook helps demonstrate the strength and promise of the U.S. semiconductor industry and why it is critical for policymakers to enact policies that boost growth and promote innovation. Download it for free today!